Have I mentioned how much I’m loving this whole race to the bottom thing? 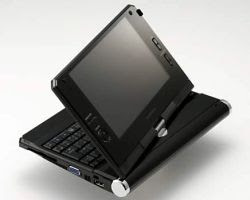 The Asus Eee PC has shown that there’s a huge demand for low cost ultraportables, and the latest company to throw their hat in the ring is Japan’s Kohjinsha, which plans to release not just a tiny laptop, but a tiny table PC. The Kohjinsha SCC will come in two models, a ¥59,800 (or about $592 US) version and a ¥79,800 ($780) version that includes Office 2007 personal edition. After reading the source article, I don’t think this is actually a tablet PC… just an eee pc competitor with a swivel mounted screen. I suppose this makes it an ideal ebook companion, but I was really hoping it was a true tablet. My girlfriend’s dad just got one in Japan. It’s really nice: I don’t know much about this processor, but it runs XP and Office and everything else he’s got just fine. I can say that the screen isn’t super clear, but it’s good enough. It’s not a tablet, but the pseudo-tablet mode is really nice for web surfing, and has convenient scroll buttons in addition to the thumb mouse. Overall it blows the eee 701 away.